You Are Here is a traveling exhibit that explores the diversity of Jewish communities across the globe through immersive storytelling. Built in partnership with JDC Entwine, this 4 installation pop-up museum toured DC, San Francisco, Los Angeles and NYC from December 5-18,2017, hosting 450+ visitors in 4 nights. This series features interactive stories of love, loss, and resiliency. Each year, thousands of young Jews join JDC Entwine to explore the world. The places they go impact them, and they in turn create an impact. From Mumbai to Kiev, to Rwanda and Beijing, they learn about the American Jewish Joint Distribution Committee's (JDC) century of international humanitarian aid work and how we are part of one Jewish world. Immerse yourself in the diversity of interconnected global communities. Where will you go? What will your impact be? 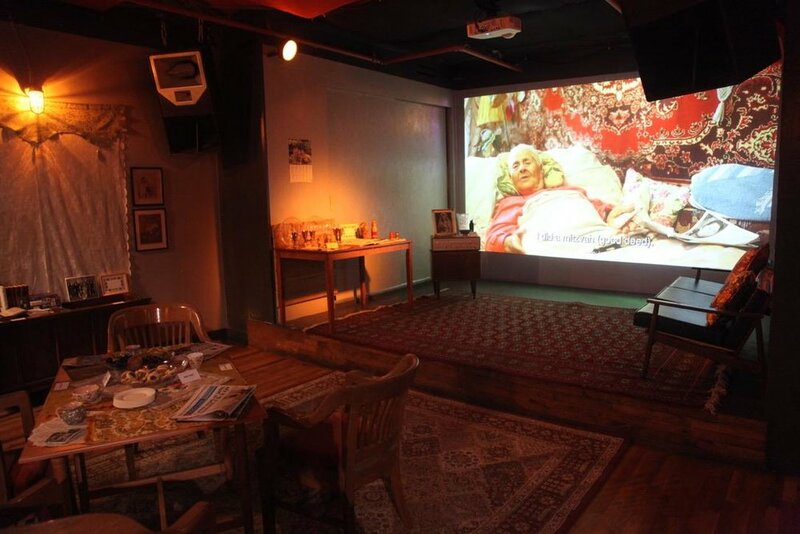 Bar with activities that engage guests in conversation and which will also be the location for remarks and a short film emphasizing the values of Jewish global responsibility. In order to manage the flow of people through the exhibit and ensure that guests can explore each component without any getting too crowded at any giving point, guests will receive a postcard with a user journey. Guests explore stories from Entwine participants in the field. The stories are told using artifacts and an audio guide which provides narration and directions to the guests. Guests will use their own headphones or ones they got at registration. Footprints on the floor will also help guests find their way to the various objects. The final stop of the gallery walk allows guest to input their ideas of what it means to be part of a global Jewish community. Welcome to Babushka's home! Babushka is grandmother in Russian. Believe it or not, touch her things and you won't get a slap on the tuchus! Follow the numbered cue cards in the room and you will unlock sacred wisdom. 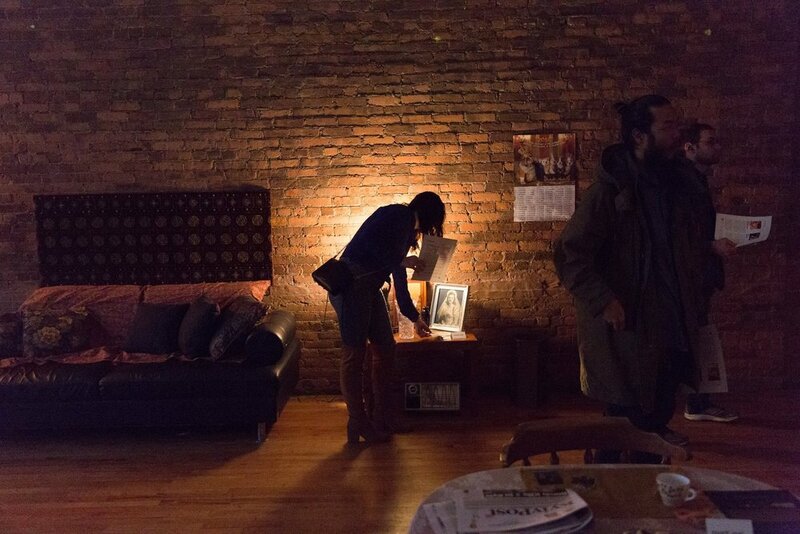 This immersive installation takes guests into the home of a Hesed client in Kiev. Guests then enter the installation, which will feels like they are entering a home - Russian grandmother style. Inside they can explore the space and its items. They can also sit on the couch and at the table where there will be cookies to eat. Guests can activate video stories in the space through motion sensors, which will be attached to items in the room. Items with motion sensors will have a sticker that says ‘touch me.’ Staff or motion sensor will trigger the first video and give directions to the guests that only one story can be projected at a time. Guests should wait for a video to finish before finding an item to touch to trigger another story. In this immersive installation, guests will move through a Kigali marketplace, to the hills of Rwanda, and then into the Agahozo Shalom Youth Village (ASYV). As guests step into the marketplace, they can touch and interact with textiles and Rwandan crafts. Visitors move through lush vegetation and time-lapse projections of rolling hills to reach the gates of a special youth residence and are greeted by images and video footage about student life featuring original student art. This room is dedicated in loving memory of Village founder Anne Heyman z”l.